Actual departure day is on 11th October, but we are too excited okay so we meet in KLIA2 at midnight. 2 of my friends landed in KLIA2 from Penang around 11.00pm. I arrived there first so I wait for them and tadaaaaa I met them after 9 months since our last trip in Penang. Rindu campur teruja uols. While waiting for our early morning flight all of us had our late dinner plus tido jugak at McDonalds. Don’t care lah because don’t worry there are other people also sleep like us. By 5.00am we woke up and get ready to check-in our luggage. 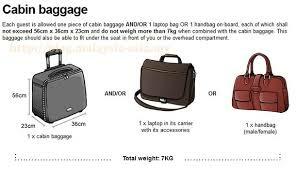 But before that, since we only check-in only one 15kg luggage, we need to sort out our things in each of our luggage because Air Asia only allowed luggage not exceeding 7kg within this dimension 56cm x 36cm x 23cm only. So we put all liquid and canned food in the check-in luggage. If you guys are cheapskate like us you can follow this rule. Bila balik baru check-in for other luggages. Security scanning and other procedure went smoothly for us and we are set to fly at 8.00am. After 6 hours and 20 minutes, we arrived at Incheon International Airport at 3.20pm kst. I am so happy and still can’t believe I was actually at Korea! We took almost 1 hour rest at the airport before we move on to check-in to our guesthouse. We took the AREX train from Incheon Airport to Seoul Station, it cost us 6,000 won, bought it at the counter near the AREX station. It wasn’t hard to find the AREX counter location; we just follow the signage given. 45 minutes later we arrived at Seoul Station. 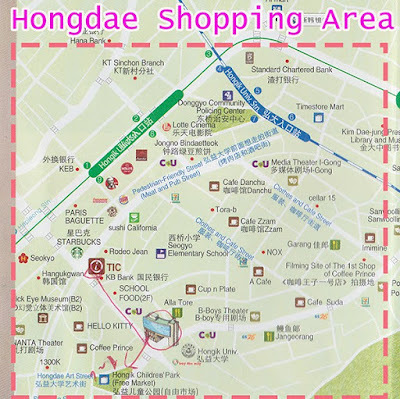 From here, we have to take the subway to Dongdaemun where our guesthouse located. Upon arriving at Seoul Station, we top up our T-money card (which we got it free from KTO, if you don’t have it, you can buy it at their stores) for 30,000 won using the top up machine. This amount last till around 6 days. Travelling via Korean subway is easy. Thanks to the Subway apps.. It wasn’t so hard to understand their subway system. But of course la first time we were a lil bit confused. There were lots of people and direction after you come out of the train. Don’t panic. Just note which exit you are heading and tap the T-money card which function as the same like the touch n go system. Yada yada after we figured out where is the exit to our guesthouse (after getting lost pusing-pusing at the station with our luggages), then we make a move to Seoul Dalbit Guesthouse Dongdaemun. The host gives us a clear direction to their guesthouse so it was easy to find. On the way, we stopped at 7 eleven and bought drinks (coffee is a must haha) and instant rice. Walk and walk taraaa our guesthouse is here! I love this guesthouse because it feels like home, even though the room is small but I don’t mind. I really love the kitchen area. 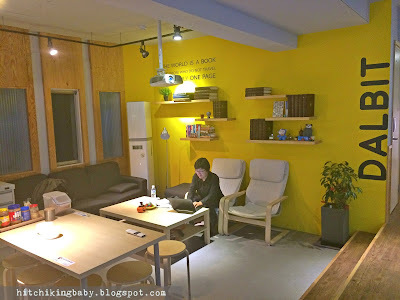 Rest area at Seoul Dalbit, I will give you my review on the next post. Now we are hungry! Tak makan since dalam flight 6 jam tu. My friend packed daging masak kicap from home and we ate that with rice. No time to lepak lama lama, we get ready and yay lets go to our first destination – Hongdae Street. We arrived late at 8.00pm but we don’t care haha. We took the subway to Hongik University Station (Line 2, Exit 9). And right away you see there a lots of shops selling clothes, souvenir, cosmetics, phone accessories and other shops right on your left. I didn’t buy anything except for coffee because so sayang nak spend lagi at this time. There also have musician who plays instruments and singing on the street. Nothing much here, we just hop from one shop to one shop and it’s already late. End of Day 1 of my South Korea Trip. Breakdown for the money spend for day 1 including flight tickets and guesthouse room for 5 nights. See you lovelies on the next post.